happy almost fourth of july!! i realize this matcha cake with strawberry swiss meringue buttercream isn’t really patriotic looking, but if you think about it, it sort of is. the buttercream started out white, and the strawberries are the red, and green is made of blue (ding ding) and yellow. um, sorry for the lameness; at least it’s yummy, right? i went over to yang‘s house with the expectation we’d be doing the 2000 piece puzzle she bought earlier that day, or maybe starting on the grad gifts we were making for the recently graduated hs seniors that we didn’t have a chance to make posters for when they walked during grad. i still brought over two 6.5” and two 8.5” round cake pans, “just in case.” i should have known. she mentioned matcha, and i’m powerless against baking. and then she started talking about matcha and strawberry, a combo that has been lingering in my mind for a long time (case in point, the strawberry panna cotta with matcha whip that i had started earlier that day, and the strawberry green tea drink i mentioned to my mom). the batter got divided into two 6.5” round cake pans for two admittedly very huge cakes. she suggested 8” round pans, or cutting out portions from a sheet cake; the first option didn’t seem special because that’s a normal sized cake. at the risk of sounding way too juvenile, it wasn’t cool enough. and making a sheet cake, and using that to cut out rounds seemed like a recipe for a ton of scraps (which were bound to be deposited into my stomach, no food waste here). because the cake pans were filled really high, they ended up baking for 50 minutes. they poofed up substantially, which probs wouldn’t have happened if the tins weren’t so full. you could take the cakes out of the pan and level them that way. or you could leave them in the pan and use the pan as a guideline where to trim the cakes. the pan guideline worked well for us, particularly because neither of us have grey’s (anatomy)-worthy steady hands. in either case, use a serrated knife, since that cuts through the crumb nicely. in a classically stereotypical case of losing your battle with temptation, we said we weren’t going to eat the cake tops, and then we ate one, then the other. not methodically, either, just a consistent munching. oh dear. that top was so crunchy and brown (btw, don’t worry that it’s brown and not green- cakes always get brown on the outside no matter what, helloooo maillard reaction). we didn’t cut the layers in different parts crosswise, but if you want a higher frosting to cake ratio for your final matcha cake with strawberry swiss meringue buttercream, you can do this. i decided to halve the frosting because there was bound to be less surface area to cover. maybe it’s because i was expecting it to take a long time, or maybe it was because there wasn’t that much volume-wise, but it was so fast! 10 minutes total for whipping the eggs/sugar AND mixing in the butter. yang’s mixer isn’t even as fast as mine. we added ~5/8 cup (weird amount because we were too lazy to wash/hull more berries to get to 3/4 cup) fresh strawberry puree; the buttercream separated for a second, but came back together soon after. we did a tiny bit of frosting in the middle, then a crumb coat and then a normal coat after the crumb coat had set for 15 minutes. we didn’t really need to crumb coat it, but yang wanted to put to use everything she learned from school (not the actually academic stuff, only the youtube stuff). sliced strawberries went around the base for extra color and hide the bad edges that we had trouble frosting. we experimented with a pile of chopped strawberries on top, and then a ring of berries. this took us 4 hours, though this includes the pictures and dish time, but we took longer than normal people would. we also ate a piece of this matcha cake with strawberry swiss meringue buttercream (i can’t stop saying it; it has such a nice ring to me) that was 3 strawberry slices wide because we cut into it for pics at 1am. i knew we’d end up eating it, so i told yang to cut it 2 strawberry slices wide, but she was confident we wouldn’t touch it. it was so hard to resist when the cake was really moist but still pleasingly dense (not like those too light asian cakes). it was earthy and matcha-y and i liked that it wasn’t very sweet. the buttercream was so creamy and light and slightly tart from the berries but still plenty sweet, the perfect complement to the cake. probs could have made 3/4 batch of frosting for a higher/more balanced frosting/cake ratio, but that math would have been annoying and we don’t need more fat/sugar anyways. Grease two 6.5” round cake pans and line with parchment. In a large bowl, whisk together all the dry ingredients. In a medium bowl, whisk together all the wet ingredients except for the water. Whisk the wet ingredients into the dry ingredients and then stir in the water. The batter will be very thin. Pour into cake pans and bake at 350F until a toothpick inserted into the center comes out clean, about 50 minutes. Switch to the paddle attachment. Add butter several tablespoons at a time, beating well after each addition. Beat in vanilla. Stir in puree until smooth. Yum. 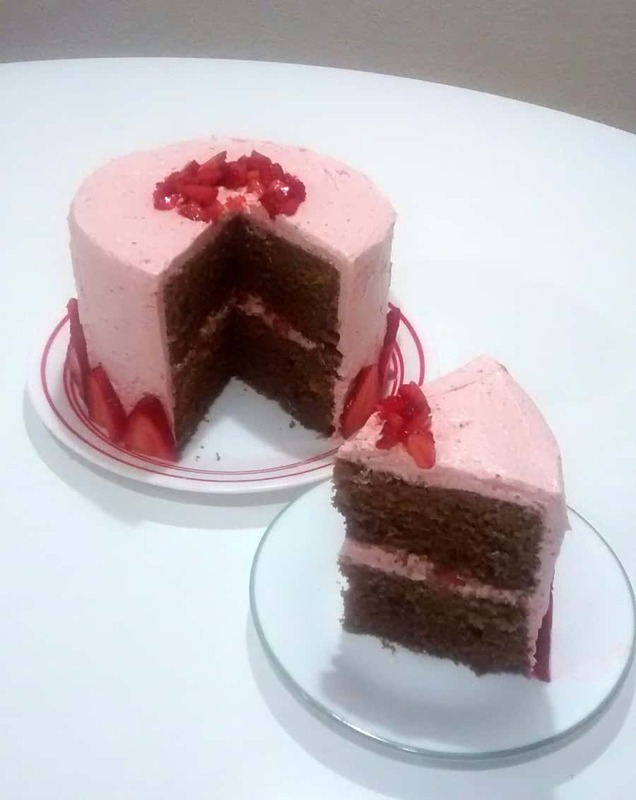 I'm a sucker for strawberry anything and this cake looks delicious and pretty. Matcha ingredients are also a plus! thanks! haha i find that i push matcha into a lot of things now, even when i probably shouldn’t. ooh, then you should! it’s pretty easy to work with, almost like instant coffee or espresso.